Old World Italian superstitions intersect with the often lunatic behaviors of modern life in the hilarious Sebastian Maniscalco: Aren’t You Embarrassed? Sebastian Maniscalco has a very, well, exaggerated way of expressing himself. Which of course makes his brand of standup comedy as much a visual spectacle as it is an acutely observed commentary on the peculiarities of modern American life. And what he brings to his analysis is especially derived from his being a first generation Sicilian/Italian/American. But more on that later. Maniscalco, a native born Chicagoan, speaks with a nasal, over-the-top Midwestern accent which is made stranger still by the punching emphasis he places on certain words. Add to that his wild-eyed expressions and impressively agile physicality bordering on dance poses (the selfie move defies male gravity) and you find yourself almost too distracted by his sheer presence to realize just how funny this guy is. If one had to sum up Sebastian Maniscalco’s opinion of modern humanity in a word, it would be: horrified. Raised by a Sicilian father and Italian mother (still to this day the distinction is made comically and otherwise, both in Italy and here in the States) he draws upon the cultural differences and comparative value systems of two distinctly different world views which often collide in hilarious ways. But Maniscalco’s comic contempt doesn’t reside solely within the realm of his Italian roots. It extends to the collective Narcissism exhibited by our social media technologies, the lagging work ethic in our labor force, and the general emasculation of the American adult male, just to mention a few of his targets. We are living in an increasingly comedic melting pot of immigrants, ex-patriots, and 1st and 2nd generation Americans whose roots have become intertwined with this dream that is America. And perhaps because of this immigrant lens, even when it skips a generation, we begin to see ourselves in new and interesting ways. It’s both a challenging and an exciting time to be funny, to look back in time and geography to see the attitudes which shaped us, and still be able to laugh at it all. 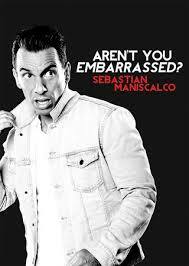 Sebastian Maniscalco: Aren’t You Embarrassed? is presently streaming on Netflix.